Mark your calendars, ladies and gents! Nonfarm payroll (NFP) Friday is just around the corner! Let’s put the euro zone debt drama aside for a moment and shift our attention back to the U.S. labor market. So what can we expect to see from this potential market-mover when it comes out at 1:30 pm GMT on Friday? Well, if my fellow market geeks are to be believed, we’ll see that hiring picked up in November, but probably not enough to bring the unemployment rate down. A Bloomberg survey reveals that the median forecast of 59 economists sees an increase of 120,000 jobs following up the 80,000 jobs that were added in October. The unemployment rate, on the other hand, will probably remain at 9.0%. But you don’t have to take their word for it. After all, their forecasts have missed their mark all but once this year! So rather than relying on their predictions, you can form your own conclusions and expectations based on recent events. Let’s begin with the factors that may negatively affect November’s employment figures, shall we? As you all know, the U.S. has been struggling to contain its growing debt, and because of this, it has been forced to tighten belts across several sectors. One way it has been saving costs is by laying off government workers. That being the case, many are expecting to see job losses in the public sector this November. Also, the uncertainty brought about by the European debt crisis and the upcoming U.S. elections is expected to take its toll on hiring. Many companies are hesitant to hire and invest in more employees at the moment because of the hazy outlook for growth. You can’t really blame them. It’s hard to commit to anything when you don’t really know what’s going to happen in the months to come! On the other hand, there are other factors hinting that we may see upbeat figures this Friday. For one, word on the street is that hiring by private corporations picked up in November. Estimates say private employment rose by 145,000, which would be a nice follow-up to the 104,000 we got in October. Some say this nice uptick may be enough to offset any potential job losses in the public sector. Also, a look at weekly jobless claims figures hints that the labor situation is improving, as claims have stayed below the line-in-the-sand 400,000 figure over the past three weeks. This means that less people are filing for unemployment benefits because they have found work. In addition, large retail corporations may have also increased their temporary hiring in anticipation of the holiday season. More shoppers = more man power needed! As more and more FOMC policymakers warm up to the idea of further stimulus before they convene again on December 13, the upcoming NFP release could seal the deal on QE3. Bear in mind that employment is one of the main factors that could affect the Fed’s decision when it comes to additional asset purchases. As for the possible impact on price action, a weak NFP figure could tilt the odds towards another round of easing. Although the U.S. dollar has been benefiting from risk-off trades lately, downbeat jobs data could undermine its safe-haven appeal. 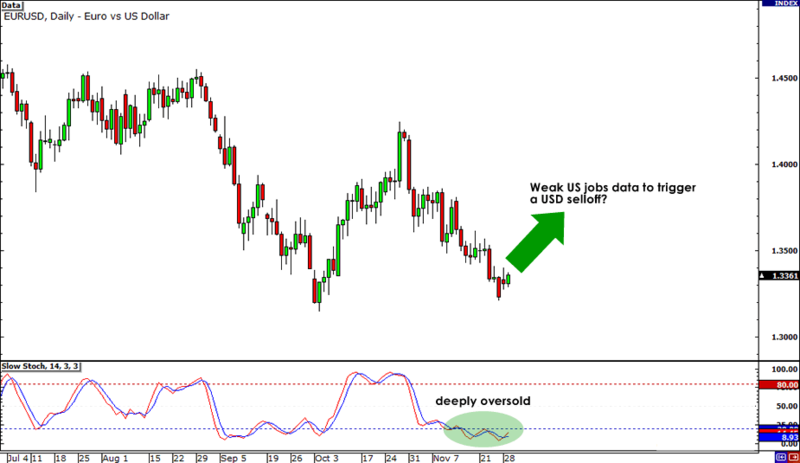 Taking a look at EUR/USD’s daily chart reveals that the pair is already deeply oversold and the NFP could be a catalyst for a bounce. Of course that’s just one of many possibilities. What’s important is that if you do decide to trade the NFP report, make sure you practice proper risk management so you don’t wind up blowing your account. Be careful out there! Will November’s NFP report push the Fed closer to QE3?